Ho! Another delayed post; I said I’d get to this before the semester was up, but this semester hit really hard, and I just haven’t had the time or energy for it. Well, it’s not Christmas yet, so I guess that’s something, no? The real killer module this semester was Game Development, which consisted of a single group project with three other programmers and seven(!) 3D artists. I started to put a page together for the game we created, “SplashDash”, today; I still need to go over what I’ve written with furrowed brow and fill out the Freerunning Implementation section, but there are already download links for Windows, OSX, and Linux builds, a gameplay trailer, and lots and lots of screenshots to see! 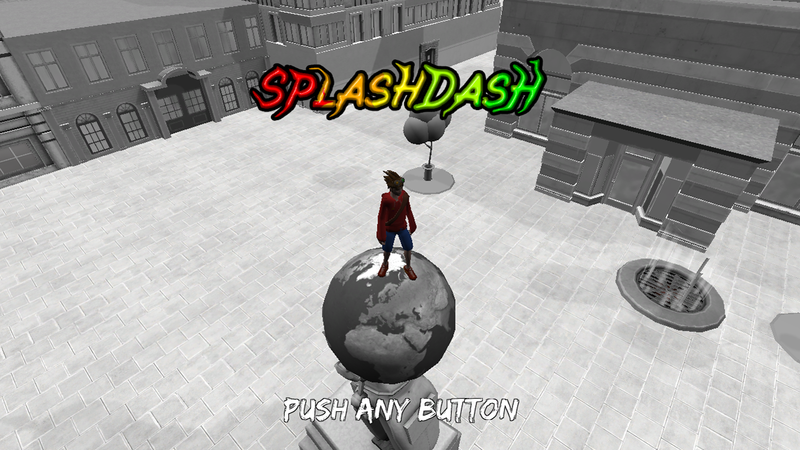 SplashDash is a 3D, freerunning, score attack game, drawing inspiration from games like Jet Set Radio, Tony Hawks Underground, Mirror’s Edge, and de Blob. Robots have taken over the world and subjected it to their ideals of order and optimisation. They’ve whitewashed all the walls and broken the spirit of the human population, who now go about their daily chores like mindless drones. The player is a teenager gifted with the ability to bring colour into objects with a single touch, and must use it to paint as much of the city as possible in the given time limit to inspire a human revolution. My main responsibility was the implementation of the player movements, including running, analogue jumps, wallruns, ledgegrabs, vertical wallruns, wallrun jumps, and wall rebounds. I also worked closely with the programmer and artist responsible for the animations to try and make sure things looked as smooth as possible, and though some animation glitches remain I’m pretty pleased with the way things turned out. The freerunning implementation is, honestly, pretty unrefined, as I’ve never coded such complex 3D movement mechanics, nor used Unity before, and time constraints on the project meant that I could not afford a lot of research or iterate as much as I would have liked. I opted to go with a system which did not require any hints or triggers to be placed into environment, so as to minimize the workload of environment construction. Let’s just say there are a lot of raycasts and a lot of vector maths involved; you can read more about it (once I’ve written it) and my other contributions on the SplashDash page. We’ve all learnt a lot from this project – mostly about working with Unity, its flaws, quirks, features, limitations, and best practices, but also more transferable skills. We had some communication and organisational issues (which I’ve written about at length for a post-mortem as part of the assessment, and shan’t post online yet) that I think are easily solvable once identified; some simply by picking the right tools and channels, and others by encouraging certain practices. The project was also a good insight into the importance of sorting out your methodology and workflows out early on in a group project – I feel that with time invested in the right places at the start, things would have progressed more quickly, and in a more organised fashion. Anyway, I think it’s pretty effective as a proof of concept – or not, as the case may be. We all agree that the movement is the most fun part, and that a linear time trial or racing mode, on maps similarly constructed to the tutorial level, would probably be more fun (especially with some nice acceleration mechanics thrown in to reward good freerunning flow). But it is quite fun, all the same, and I think the concept deserves further investigation which, if I ever find the time to experiment with a proper non block-based painting system, I might just be tempted to conduct.